HOT STREAK. There is data to show what career to pick if your only goal is to make an impact. Hot streak a period when a person’s performance is exceptionally high compared to the routine work. Federer had a long hot streak compared to other tennis players. Right now, Croatian soccer team is another good example. This beautiful paper by Liu and others, published in Nature (arXiv link here, page 72) shows the chances of a hot streak for scientists, artists, and movie directors. Their main conclusions: age is just a number, the hot streak can happen at any age, and most likely it is going to be a one time event. This plot from the same paper shows hot streaks for scientists by fields. 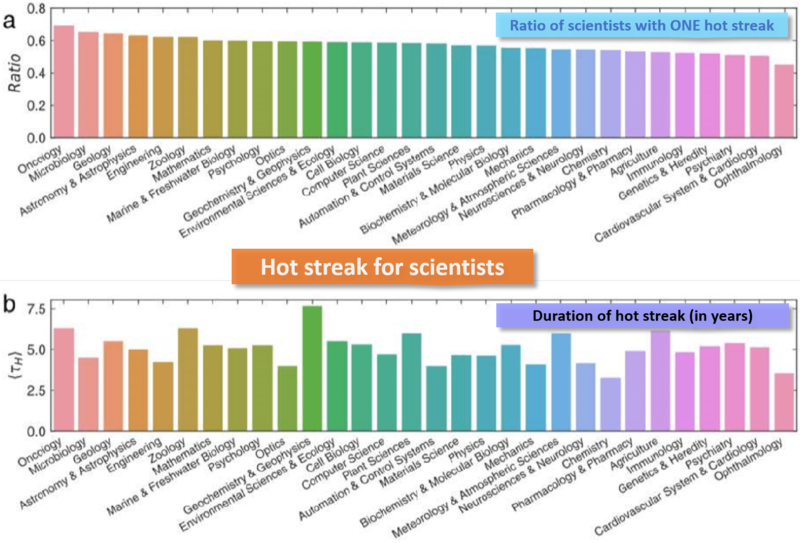 Those still planning their careers, here a tip: higher ratio of hot streaks are in cancer research but they seem to last longest for Geophysicists. Source: Nature 559, 151-152 (2018); plot from Arxiv paper of Liu, Wang, et al.